By examining each of these points carefully and adapting them to suit your customer’s needs, you will generate a marketing promotion for your dog grooming services that will bring in the customer traffic that you require. When you start your own business as a professional dog groomer, it is clear that your potential customers are people who own breeds of dogs that require grooming. By doing a little market research (which can be as straightforward as talking to dog owners) you will be able to establish if there are any particular dog grooming requirements which have a likely demand in your area but are not being supplied. If you’re a dog owner, parks and local nature trails where people walk their dogs are a good (informal) place to make conversation and discuss their dogs and their grooming needs, whilst also introducing yourself and your new grooming services. By paying attention to the comments you receive and analysing the overall reactions, you can establish if you need to make any revisions to the range of services and products that your grooming business will offer, so that you can match your new business as closely as possible to the requirements that local people have. Track which of your grooming services are most popular, which have an increasing demand, and which are becoming less desirable to your customers. The customer’s needs are likely to change/evolve over a period of time (even affected by the varying popularity of different breeds of dogs). If you ignore these changes your services may become less desirable to your customers. The only way to address this point is to track your sales for various grooming cuts / services to see how well your customers are responding to what you offer and incorporate the subtle changes as they occur – so your business and services, and its marketing, continuously evolve without the need for any radical changes that react to a market that has already moved on. This involves (temporarily, in most cases) lowering the price(s) on selected breeds, styles, products or services to give customers an incentive to purchase. Price reductions (sometimes in the form of discount vouchers) can be used to attract customers to try your dog grooming service when they otherwise may not have had any reason to change from an existing supplier. Contact with local dog breeders (of breeds requiring grooming) is always a good marketing step, and you could offer an introductory discount offer to owners of new puppies that they sell. If you are releasing a brand new product or service onto the market it will be unknown and untried by your customers. Preferential pricing is an ideal way of getting your new dog grooming business tried by many of your potential customers. How you introduce a new service will need careful consideration, including it’s pricing (and perceived value) and the associated promotion. If you undertake this exercise, ensure that you also give the non-promotional prices to emphasise the saving (as well as conditioning the customer for the true value at the end of your promotional period). Place simply refers to where you will sell your products to your customers. As a dog groomer you will be supplying your service directly to your customer (not via a distribution chain or through a third party). If you are intending to open a dog grooming salon, your premises and location are an important aspect of your business and marketing planning. They need to look professional, clean and project an image that reflects the high level of service that you offer. Possibly the closest retail business to draw a comparison with would be a hairdressers. If your intent is to work mobile (or to offer a home collection and delivery service) then your customers may not ever actually visit your salon. The van, or other vehicle, should be in good condition and sign written with details of your business. Having this done professionally will not only look good, it will provide a mobile billboard advertisement for your business – be sure to include your telephone number and a web site address (if you have one). An advertising promotion needs to be carefully planned and budgeted. This is an area of your business that can be costly if each expenditure is not carefully considered and planned to hit the targets that you have. Ideally, you would set one main objective that you want to achieve from your promotional activity within a determined period of time. As a part of the advertising tools for your business you will most likely produce a leaflet or brochure. This can be an effective tool for detailed dog grooming marketing and promotion of your business and the range of services that you offer. It's worth bearing in mind that the higher the media profile is, the more expensive the advertising is likely to become. TV is the most costly medium, followed by national commercial radio. Local radio and local newspapers are more suitable and cost effective for local businesses and ‘packages’ can often be negotiated for campaigns or long-term advertising. Don’t overlook localised advertising opportunities in pet stores, vets, offices at local nature reserves and other locations where dog owners are likely to frequent. Whatever media you choose, you must ensure that your advertising will reach and have the right impact on your potential customers. Poor advertising decisions may cost you a lot of money and produce disappointing results. A dog grooming business is heavily client oriented, so you will need to start to build a client list as quickly as possible. The grooming cycle for most breeds is about 6 to 8 weeks, so it is clear that you will need sufficient business to fill your working hours for each week, multiplied by about seven weeks. 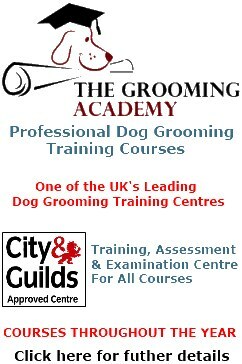 For example, if you have the capacity to groom an average of five dogs each day, and you intend to work five days each week, then this will create a need for 25 dog grooming appointments each week – multiply this by (an average of) 7 weeks, and its easy enough to see that you will require approximately 175 dogs throughout the grooming cycle to be working at full capacity. When you are setting up a new business, a press release circulated to local newspapers and radio stations may give you some ‘free’ advertising coverage locally. By far, the best form of advertising that you can have is word-of-mouth, where your existing customers recommend you to their friends and neighbours – so remember that every single dog that you groom is a walking advertisement for your service.